Train journeys are different and exciting. When sitting next to a window and enjoying the fast moving world pass-by is the wonderful part of any train journeys. A little different from the usual railways, the mountain railways are even more interesting. Yes, they go around the hilly terrains by amazing all the passengers. Mountain Railways is one of the must-experiences in India. Today, three mountain railways of India together is declared as UNESCO World Heritage Sites. The Darjeeling Himalayan Railway was the first mountain train (toy train) in India. Later, it was the Nilgiri Mountain Railway and Kalka-Shimla Railways which together got the status of World Heritage Sites. In this article, let us make a journey through the Nilgiri Mountain Railway which travels through the most amazing destinations of Tamil Nadu. These stations are not only the holiday destinations but also some of the most famous film shooting locations in South India. Nilgiri Mountain Railway was once a steam locomotive which now is a diesel locomotive. A journey in this toy train will take you around the beautiful locations. Nilgiri Mountain Railway was started by the British in the year 1908. Nilgiri Mountain Railway travels from Mettupalayam to Ooty. Nilgiri Toy Train starts from Mettupalayam then passes via Kallar Station, Adderly Station, Hillgrove Station, Runnyemede Station, Kateri Road Station, Coonoor Station and finally reaches Lovedale to Ooty. Nilgiri Toy Train covers around 26km in the narrow hilly regions of Tamil Nadu. Coonoor is one of the famous film shooting locations in Tamil Nadu. The Coonoor Railway Station was part of David Lean's 'Passage to India'. The most popular Hindi Song 'Chaiyya Chaiyya' starring Shahrukh Khan and Malaika Khan Arora from the movie Dil se was shot on top of Nilgiri Mountain Train. Nilgiri Mountain Railway travels uphill through the steepest railway track. 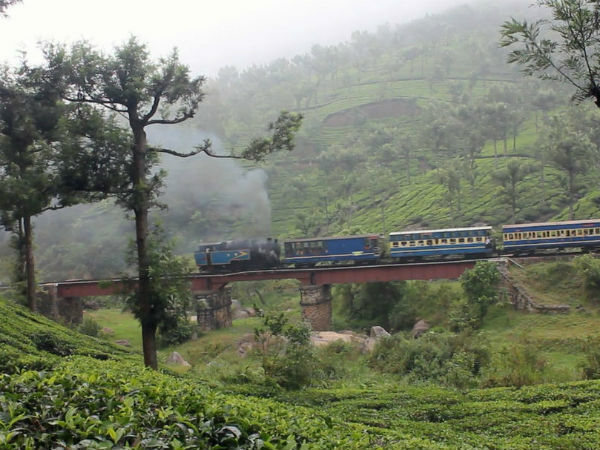 Nilgiri Mountain Railways is one of the most popular mountain railways in India.